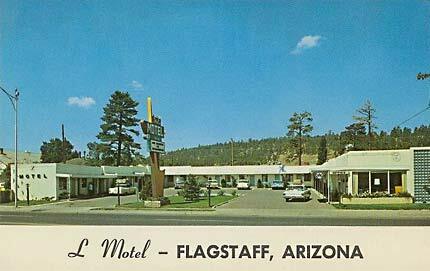 The L Motel is ideally located on historic Route 66 and within walking distance of Northern Arizona University and Downtown Flagstaff. 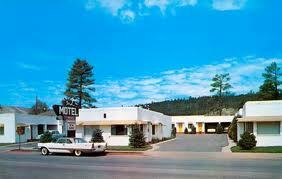 This Flagstaff hotel is minutes from Lowell Observatory and Arizona Snowbowl ski area. This is the perfect location to enjoy the cool mountain air of the San Franscisco Peaks. Take a day trip to Sedona, featuring a stunning array of red sandstone formation, the Red Rocks of Sedona. Witness a sunset or sunrise and see the formations glow in brilliant orange and red. Several unique shops are within minutes of the hotel. A variety of restaurants and cocktail lounges are located in the surrounding area. This Flagstaff hotel offers amenities like a free continental breakfast and free local calls. Business travelers will appreciate conveniences like free wireless high-speed Internet access in all rooms and access to copy and fax services. All guest rooms come equipped with refrigerators, microwaves, coffee makers and flat screen television. In addition, some rooms have desks. All rooms are Non-smoking. The convenient location, great accommodations and affordable rates make the The L Motel the perfect place for business and leisure travelers.
" Rest Well at The L "
A complimentary breakfast is offered each morning. Public areas are equipped with complimentary high-speed wireless Internet access. Complimentary self parking is available on site. 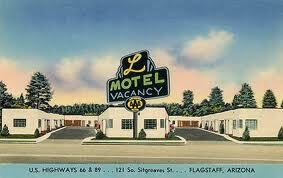 The L motel is an authentic Route 66 property built in the 1940's that has been lovingly restored and preserved. Tourists from all over the world have stayed at the L to experience the charm, history and atmosphere of the mother road. The building was built in a Pueblo Revival style and then remodeled to International architectural style in 1965. The renovations were done to keep the motel in sync with the changing styles and eras of route 66. The hotel was called Rodeway Inn for about six years until new owners took over and in an attempt to revert it to it's previous glory, changed it to it's original name the L motel. This was done as tribute to the motel's route 66 glory days. Please come and enjoy your stay at the L motel as you wander through the Northern Arizona mountains, the Grand Canyon, breathtaking vistas, Indian reservations and the spectacular sunrises and sunsets. Whether you are taking the road trip of your lifetime on the mother road, or just coming to escape the the heat of the valley, we have got a warm welcome and cozy room just for you!